If you recognize the Italian phrase per noi, it might be from Andrea Bocelli’s torrid love song of the same name. In Italy, it means “for us.” Here in Salt Lake City, it’s the name of one of my new favorite restaurants: Per Noi Trattoria, a restaurant that is definitely for us. Per Noi is, first and foremost, a family affair. Diners are often warmly greeted by Uncle Giacomo or owner/chef Francesco Montino at the door. Montino bounces happily from the small kitchen to the dining room, frequently checking on customers and, quite often, offering them a little something gratis, “just a taste,” like freshly roasted peppers or a small plate of eggplant parmigiana. Francesco’s brother Paulo works as both a server and a cook; he’s responsible for the amazing housemade eggplant & mascarpone-stuffed ravioli I enjoyed the other night. And Montino’s business partner, Tony Casella—he’s from Sicily, while the Montinos are Neapolitans—can sometimes be found in the kitchen, tweaking the pomodoro sauce or busying himself with the Bolognese. “Sicilians make the best sauces,” says Francesco with a wry smile. Yes, this is an authentically Italian restaurant, from top to bottom. How did it take me a year to discover this little gem since it opened? Well, for one thing, they just recently acquired a liquor license, and sipping wine with lunch or dinner makes dining at Per Noi an even more authentically Italian experience. Although, it must be said, the wine choices are pretty puny. This is a small, independent eatery, and I’d imagine there’s neither much room nor budget for a big wine inventory. Still, they could benefit from adding a few more smartly selected Italian wines to the tiny list. Of course, you can always bring your own (there’s a $7 corkage fee). Seated in the cozy restaurant, you’ll be given a basket of warm bread with a small plate of olive oil and balsamic vinegar. The bread, which is baked by Paulo Montino, is rustic and scrumptious, torn into bite-size chunks that are perfect for dipping. Enjoy the bread while you await delivery of the calamari fritti appetizer ($7.95). It’s a large mound of perfectly crispy calamari, served with a bowl of housemade marinara sauce. (Maybe I should dispense with the descriptor “housemade” here, since just about everything at Per Noi is housemade.) I’m normally not crazy about eggplant, but I absolutely loved the eggplant parmigiana appetizer ($5.95). Slices of eggplant are layered with Parmigiano-Reggiano and mozzarella cheeses, and bathed in Per Noi’s remarkable pomodoro sauce. The pomodoro is a simple, all-purpose sauce of garlic browned in olive oil, a little onion, fresh herbs and tomato. During my visits to Per Noi, there was only a single “miss”: the arancini ($4.95). Arancini are deep-fried rice balls, usually made with mozzarella and peas, sometimes meat, breaded and fried to a golden color. They’re called arancini in Italian because they look like “little oranges.” Well, at Per Noi the arancini—one per order—is not so little. In fact, it’s mammoth. The problem is that with a rice ball that large, it’s difficult to keep the entire thing thoroughly warmed through. So, the arancini was tepid in the middle, where the tiny hidden meatball resided. That, however, was the only blotch on an otherwise perfect record of delightful meals I’ve enjoyed at Per Noi. Freshly made potato & flour gnocchi ($12.95) comes with a choice of sauces: pomodoro or Bolognese. I recommend the former, which is lighter and doesn’t smother the tender, delectable gnocchi. Other pasta dishes such as spinach ravioli ($10.95) and the hearty rigatoni Siciliano ($9.95) are excellent, but we especially liked the spaghetti pescatore ($12.95). It’s al dente spaghetti with seafood—mussels, scallops, shrimp and calamari—tossed in a light tomato sauce. My wife, Faith, is particularly fond of this dish; I lost track of the times she said, “I love this sauce!” somewhere around the 13th. A Margherita pizza ($9.95) that I enjoyed for lunch was spot-on, as was the grilled salmon ($13.95), accompanied by roasted potatoes, string beans and zucchini. And, I really liked the pollo piccata ($14.95), a tender, boneless chicken breast bathed in a silky lemon-wine-caper sauce, again served with those scrumptious roasted spuds and veggies. I’ve saved the best for last: lasagna. OMG, the lasagna ($10.95) at Per Noi is, quite simply, the best I have ever tasted. The key to this lofty lasagna is the pasta, which is made from scratch. 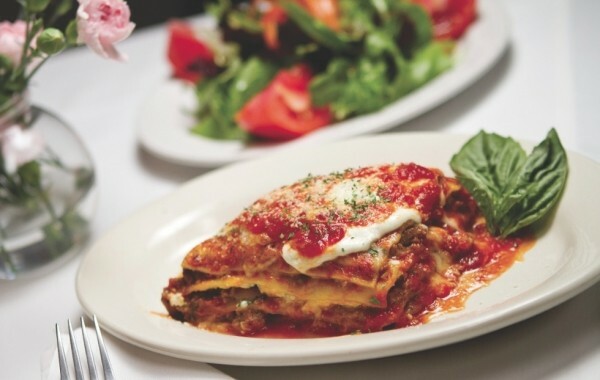 Sheets of housemade lasagna noodles are layered with a mix of mozzarella and ricotta cheeses, along with Per Noi’s robust Bolognese sauce, and topped with Parmigiano. The noodles are cooked to an absolutely perfect al dente, not mushy like so many lasagnas I’ve tasted. The result, like so many things at Per Noi, is simple perfection. Bliss is attained by eating that lasagna, followed by any of the delicious Per Noi desserts ($3.95): cannoli, tiramisu or panna cotta. While talking with Francesco Montino about his cooking after a recent meal, I remarked that, while his food is attractively presented, it’s not “art for art’s sake.” Dishes at Per Noi—including the plain white plates they’re served on—aren’t overwrought, ornate or complicated, although the flavors can be complex. Montino’s cooking isn’t about ego. In fact, he went on to say, “The only way I know how to cook is with love.” I know tons of chefs who claim to be passionate about their food and their cooking. But, I don’t meet many who speak of cooking with love. Well, as Dean Martin sang, “that’s amore,” and you’re going to love Per Noi.